Having a black hair on the smooth milky skin surface is a crime. It is great to do the waxing in the nail shop with the official honey for waxing and using the muslin cloth to remove the hair. The hair will grow after few days when you use shaver so it is better to remove the roots of the hair. Comparing to other products the Nad’s is expensive but can really remove all the hairs. It is good for removing the fine hair on the hands however much better for using arms, legs, and under arms. Great for summer season and can be used really well. There isn’t much smell to it. 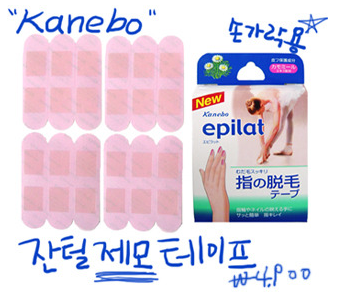 Kanebo tape is much easier to use. This product is for the fingers. Place on the part were there is hair and taking out from the reverse side it stings a little and removes all the hair. It is recommend to the people who brings down the social image because of the fine hairs on the fingers. If you have too much hair and gives you worries do a laser treatment could remove it eternally. Receiving the care for 2 to 3 times is enough. Per treatment it causes about 50,000won.